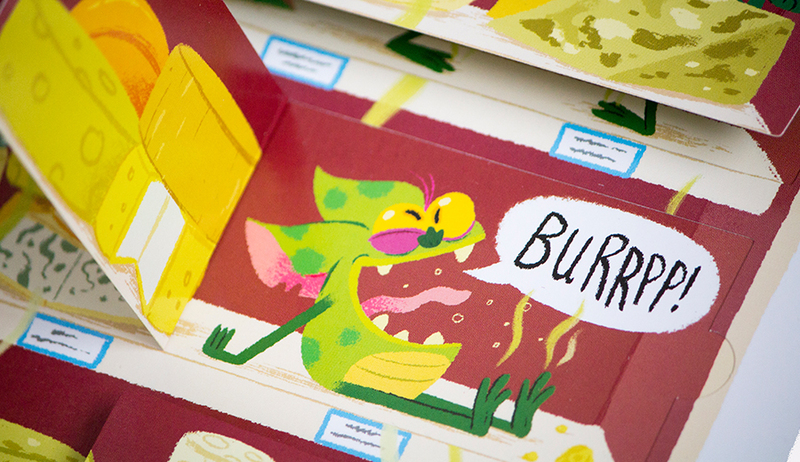 Naughty gremlins bring chaos to the supermarket and beyond in this hilarious new series - you'll never see supermarkets in the same way again! Gremlins are weeing on the floor, snoozing on the bread and is that a gremlin bottom in the fruit stall? Lift the flaps to find them all! Another rhyming romp from Adam and Charlotte Guillain, authors of Spaghetti with the Yeti. Supermarket Gremlins marks my first time working with Egmont and the talented Adam and Charlotte Guillian and it was great fun to make. I thought it might be interesting to some of you folks to show you a little bit of the behind the scenes and what went in to creating this book. 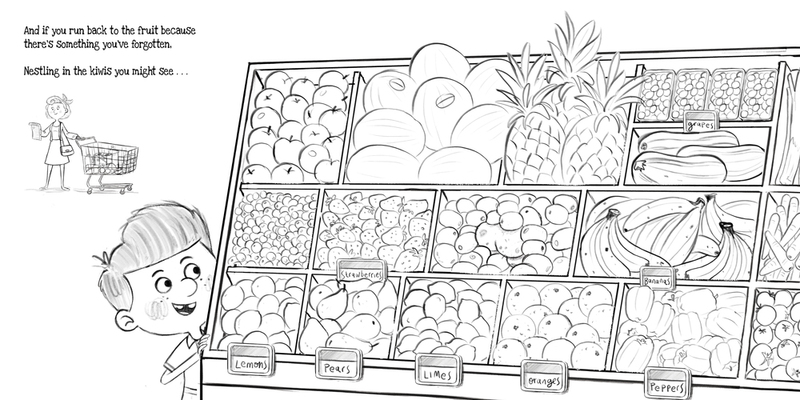 Egmont approached my agent and they asked if I would like to create a sample illustration for the Supermarket Gremlins text. I loved the story and immediately saw the potential fun we could have with all the gremlins causing chaos. Below is a small selection of early character design pencil sketches. I knew I wanted to stick with the conventional description that people associate with gremlins, but with a naughty, cheeky, and weird charm to amuse the reader. I didn't want the gremlins to all look too similar so I played with different shapes and the position of the features with in this shape, and variations of green to create different looks and personalities. I also gave them some names just for fun. 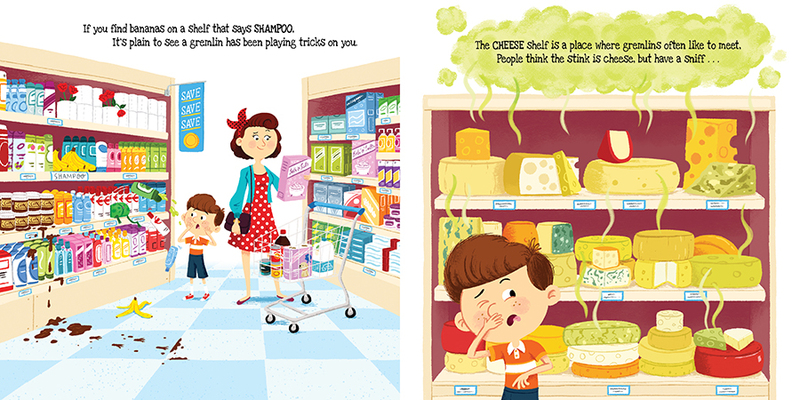 I used these designs to populate a supermarket aisle to give the client an idea of how a spread may look. Below you can see the process of creating a final spread from thumbnail to final artwork. I will generally sketch out on paper small thumbnails and then bring these into Photoshop where I can rearrange things for a better fit and composition. These sketches are then used as a base to create a more detailed pencil rough. Once approved by the client I like to create a colour rough. I try to keep these as loose as possible. Creating colour roughs allows me to play with colour combinations much quicker and try out various ideas so all the decisions are made before I start work on the final art. It saves a lot of time in the long run, it's great to show the client too as they can get a better sense of how the final book will look. I then move on to creating the final colour artwork. The spreads in this case were slightly tricky due to the addition of flaps, which reveal the gremlins below. These flaps could not overlap another flap from a previous page, so I had to think a head all the time and work out the placements of the flaps carefully. It was a challenge, but hopefully one that I overcame. You can learn to draw a gremlin with my step by step guide and you can also create your very own paper toy gremlin, simply click on the images below to download the PDF.